Anything shaped like donut tastes better, at least, that’s my opinion. I love banana bread and always want to glaze it with something. So, I decided to bake it in a donut pan and glaze with chocolate, shredded coconuts and sprinkles. This recipe is Not A Donut Recipe, it’s banana bread in donut shape. If you are looking for a donut recipe, move on and I don’t want to get in your way to those tasty donuts. However, these cuties are just as addictive and delicious, you should give it a try. 2. In a large bowl, mash bananas. Add eggs, butter, vegetable oil, vanilla extract and milk, mix well. 3. In a medium bowl, add flour, sugar, brown sugar, cocoa powder, salt, cinnamon, baking powder and baking soda, mix well. 4. Mix half of the dry ingredient into wet ingredients until well combined. Fold the rest of flour mix into batter until just combined. 5. Grease donut pan with unsalted butter (not included in recipe), fill each donut mold about 3/4 full, bake for 13 – 15 minutes or until toothpick test come out clean. 6. Cool in pan for 3 minutes, remove and place on metal rack to cool off. Eat immediately or decorate as desired. This entry was posted in Baking, Baking 烘焙, Cooking 小煮意, Dessert, Dessert 甜品, Easy Cooking, Easy Cooking 簡易煮意, English Recipes 英文食譜 and tagged Baking, banana bread, Cooking 小煮意, Dessert 甜品, donut, Easy Cooking, little panda mommy on January 31, 2016 by littlepandamommy. This entry was posted in Baking, Baking 烘焙, Chinese Recipes 中文食譜, Cooking 小煮意, Dessert, Dessert 甜品, Easy Cooking, Easy Cooking 簡易煮意 and tagged afternoon snacks, Baking, Baking 烘焙, Chinese Recipes 中文食譜 on July 14, 2015 by littlepandamommy. Banana is one of my daughters favorite fruits, so nutritious and convenient. It is a great ingredient to add in bread, smoothies or baked goods. This bananas walnuts bread has a sweet crispy crust, I like a dense feel of this bread, if you like a lighter and softer bread, use 1.5 cups of flour instead of 1.75 cups. I used 1.5 cups for cupcakes size banana bread, if you like to try that, cut the cook time in half to 30 minutes, the smaller the bread, the faster it cooked. To make the crust crispy, a cast iron pan is essential, increase the temperature to 375F at the last 5 minutes, will make the crust even more crispy. Rest 10 minutes before serving, the crispy crust only stay for a few hours, overnight baked good never taste as good as it fresh out of the oven. This entry was posted in Baking, Breakfast choice, Cast Iron Recipe, Easy Cooking, Lodge Recipes, Recipes and tagged Baking, banana bread, cast iron banana walnuts bread recipes on March 6, 2014 by littlepandamommy. My husband wanted to have chicken pot pie but don’t want the puff pastry on top of the soup bowl like traditional one. 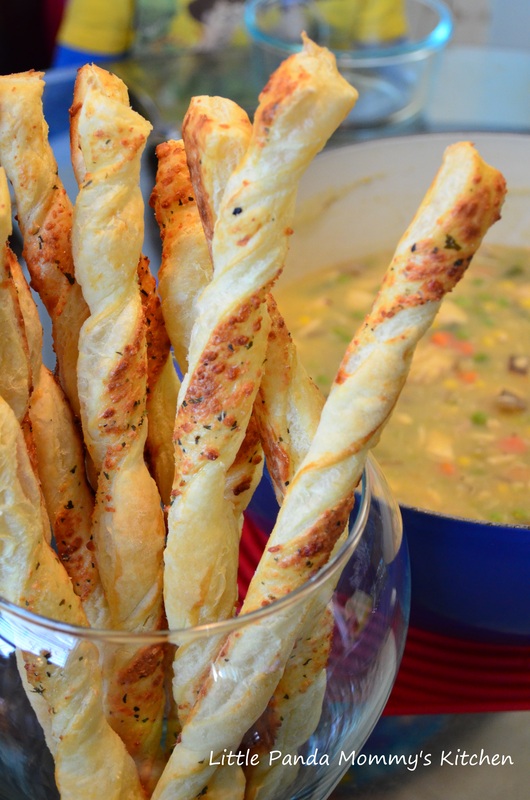 So I turned the puff pastry sheets into this tasty appetizer and served as dipping bread sticks on the side. The girls loved it so much and finished them within 5 minutes. This entry was posted in Appetizer, Baking, Easy Cooking, Snack Recipes and tagged appetizer, Baking, Easy Cooking, Puffy Cheese Sticks on August 20, 2013 by littlepandamommy. Blueberries are in season right now. I love this little blue fruits that are so small but so good for you. Eating them raw or blending in a breakfast smoothie are the easy ways to go. To satisfy my girls’ (alright, mine too) sweet tooth, I put this little super food into bake good too. Since the blueberries will become very juicy during baking, I used Xanthan Gum to turns the blueberries juice into a smooth jam like consistence. If you don’t have it around or couldn’t get it in your regular grocery store, substitutes it with corn starch. 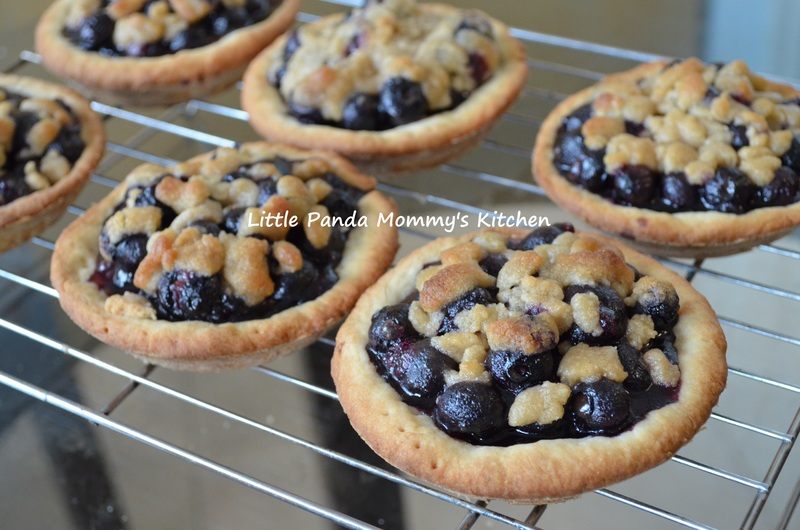 This entry was posted in Baking, Dessert, Easy Cooking, Healthy Eat and tagged Baking, blueberries pie filling recipe, Blueberries pie recipe, cookie pie crust recipe, easy cook, Easy Homemade Blueberries Pie Recipe, top crumbles recipe on August 8, 2013 by littlepandamommy. This entry was posted in Baking, Breakfast choice, Dessert, Easy Cooking, Healthy Eat and tagged Baked Donut, Baking, dessert, Healthy Eat, Lemon Glazed Baked Donuts, recipe on July 29, 2013 by littlepandamommy. The little princesses love to cook with mommy. They have been helping me prepare and cook some simple food since 2 years old. This rosemary garlic bread is one of their favorites, helped me so many times before, mommy is only allowed to place them in the oven while they get the bread ready to bake. This entry was posted in Appetizer, Baking, cook in 15 minutes 15分鐘開餐, Easy Cooking, Healthy Eat, Mommy & Me Recipes, Snack Recipes and tagged appetizer, Baking, Cook in 15 minutes, Easy Cooking, Healthy Eat, Mommy & Me Recipes, Rosemary Garlic Bread Recipe, Snack Recipes on June 28, 2013 by littlepandamommy. 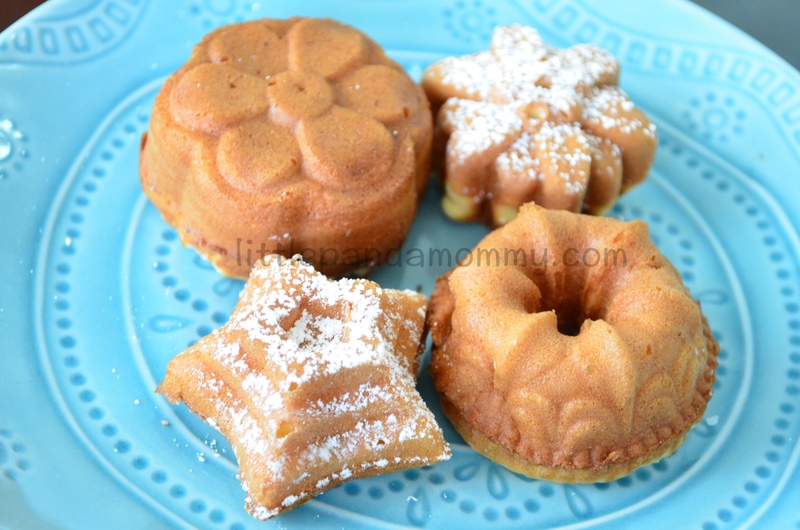 This entry was posted in Baking, Dessert, Easy Cooking, Healthy Eat, Snack Recipes and tagged Baking, Cookies Decoration Methods, dessert, Easy Cooking, Healthy Eat, No Egg Sugar Cookies Recipe, Royal Icing Recipe, Snack Recipes on January 5, 2013 by littlepandamommy.